I received this wonderful French macaron cookbook by the amazing Pierre Hermé as a gift from my husband for Christmas and I had been dying to try out a recipe. So with the help of my good friend Deanna, who is an amazing baker and cake decorator, we embarked on a culinary adventure and carefully took the 41 steps to make the first recipe in the book, bitter chocolate macaron. I had to cut a few corners with ingredients as Monsieur Hermé calls for ingredients that were both difficult to find and a tad bit out of my price range, but the result was a delicious, crunchy, chewy, über chocolatey cookie that begged to be paired with a cold glass of milk. And while our version of this delicate pastry was not perfect, I learned a ton along the way and I can’t wait to give the next recipe a try. Recipe below. xoxo! Note: measurements are metric so use a kitchen scale to weigh ingredients or use a conversion chart to properly measure ingredients. Makes about 72 macarons (or 144 shells) note: I was only able to get about 40 macarons…dunno what happened? (shrugging shoulders). 120g cacao pâte (or dark chocolate 100% cocoa) note: I was only able to find as dark as 72% cacao so that is what I used throughout the recipe, including ganache. 110g “liquified” egg whites- a very important step that Pierre Hermé stresses. Liquified egg whites are egg whites that sit refrigerated in a bowl covered in plastic wrap with one single knife incision for preferably one week. This allows the eggs to become more elastic and become soft peaks faster when whipped. 360g Valrhona Guanaja couverture chocolate note: I used 72% cacao chocolate throughout. Sift powdered sugar and ground almonds with a sieve into a large mixing bowl. Chop chocolate for shells and melt in a double boiler, remove from heat once melted. In a separate bowl, stir the food coloring into the first portion of the liquified egg whites and add this to the bowl of powdered sugar and ground almonds BUT DO NOT STIR. In a saucepan, bring the water and bakers sugar to a boil. Meanwhile, place the second portion of the liquified egg white into the bowl of a stand mixer with the whisk attachment. When the syrup reaches 239°F, simultaneously start whisking the egg whites into soft peaks. When the sugar reaches 244°F, pour it over the egg whites. Note: this may take some balancing as your egg whites might need more time to form soft peaks than the sugar needs to reach the right temp. I simply lowered and raised the temperature of the sugar mixture to keep it between 239°F-244°F until the egg whites were ready. Whisk and allow the meringue to cool down to 122°F, then add it to the bowls of powdered sugar and ground almonds, stir, then fold in the melted chocolate. Spoon the batter into a piping bag fitted with a plain nozzle. Pipe rounds of batter that measure about 3.5cm in diameter staggered 2cm apart from each other on baking sheets lined with parchment or baking mats. Note: it helps to create a “guide” by tracing a circle on parchment and laying it under your silicone baking mat or under another sheet of parchment so that it shows through. Use a sieve to sprinkle the rounds of batter with a light dusting of cocoa powder. Carefully bang your baking tray onto a kitchen town on your work surface to remove any air bubbles and help flatten each shell a bit. Leave to stand for 30 minutes until a skin forms on the surface of the batter. Note: this step is VERY important. We forgot and learned the hard way. If you don’t allow the batter to sit and forma skin, the shells cannot retain their form in the oven and spread into flat pancakes! Not fun! Bake for about 12 minutes, briefly opening and shutting the oven door twice during cooking time. Note: I have no idea why this step is necessary but we opened and closed about halfway through and once more right before we removed the shells from the oven. Also, our shells required about 15 minutes to fully cook. Take the shells out of the oven, let cool on the tray for about 1 minutes and carefully slide the parchment or baking sheet off and onto a hard work surface to cool completely. For the ganache, cut the butter into pieces. Chop up the chocolate and put into a medium bowl. Bring the cream to a boil (212°F) and pour over the chopped chocolate a third at a time until the chocolate melts completely into the cream. When the mixture cools to 122°F, add the pieces of butter a few at a time and stir to melt. Whisk to obtain a smooth ganache. Pour this mixture into a glass or ceramic baking dish and press plastic wrap over the surface of the ganache and set aside in the fridge for about 30 minutes so that it thickens. Spoon the ganache into a piping bag with a plain nozzle and pipe a generous mound of ganache onto half of the shells. Tope them with the remaining shells. 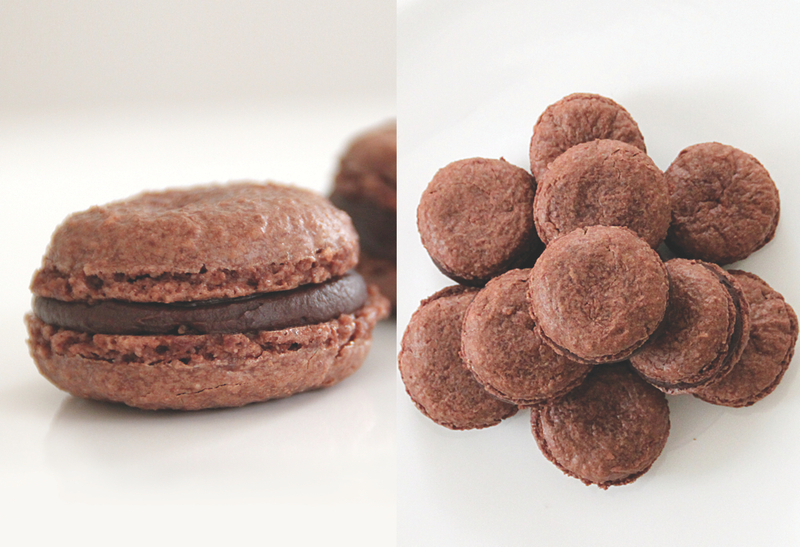 Store the macarons in the fridge for 24 hours and bring to room temperature before enjoying (about 2 hours). Thanks! Doing a little remodeling :) These macarons were pretty scrumptious, and considering the recipe calls for like a bagillion steps, it was fairly easy to follow. What scrumptious looking macaroons! I’ve always wanted to try them too but never have yet. I’ll need to change that and try these soon. Thank you! You should definitely try these, I’d love to know if you do!